The famous statue by Alexandros of Antioch - The epitome of graceful female beauty. 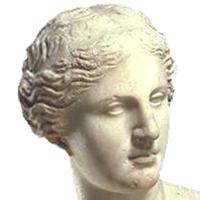 The official website for Venus de Milo, or Venus of Milos, the famous statue of Goddess Aphrodite discovered in Milos in 1820. Venus de Milo or Aphrodite of Milos (Greek: Ἀφροδίτη τῆς Μήλου, Aphroditē tēs Mēlou), better known as the Venus de Milo, is an ancient Greek statue and one of the most famous works of ancient Greek sculpture. Created sometime between 130 and 100 BC, it is believed to depict Aphrodite, the Greek goddess of love and beauty (Venus to the Romans). It is a marble sculpture, slightly larger than life size at 203 cm (6 ft 8 in) high. The arms and original plinth were lost following its discovery. From an inscription that was on its plinth, it is thought to be the work of Alexandros of Antioch; earlier, it was mistakenly attributed to the master sculptor Praxiteles. It is currently on permanent display at the Louvre Museum in Paris.